More and more people are keeping chickens in their backyards these days, and it turns out they’re a lot of fun to have around. Gone are the days when only farmers had chickens; now, you can find a small flock of hens in lots of suburban backyards across the United States. Most people keep them around for the eggs they provide, but still more have discovered that chickens have their own unique personalities that make them pretty cool pets. 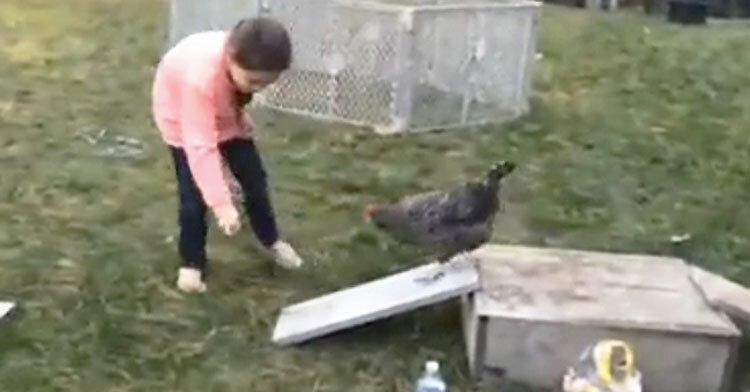 In a video that’s taking off online, a little girl from New Hampshire is captured playing with one of her favorite chickens. The creative child has designed a homemade agility course for her favorite hen. 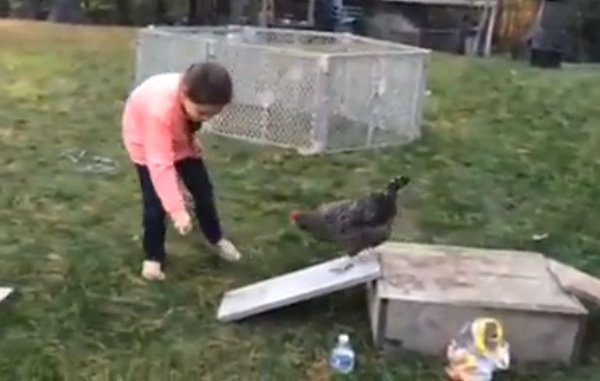 Using a piece of food to lure the bird forward, the girl leads the hen through a series of obstacles. Surprisingly, the bird does just as well as a dog might have done, proving that these animals are much smarter than we ever gave them credit for! The child leads the chicken through the maze of obstacles, including one section where the hen has to weave in and out of three poles, which she does with no issues at all. 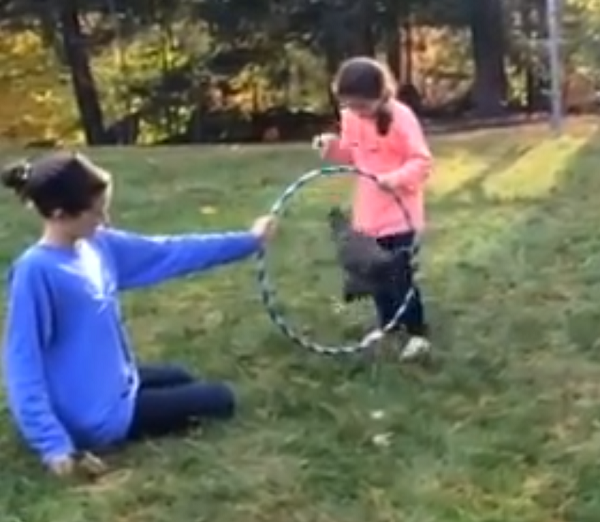 Then, for the coup de grâce, the bird approaches the final obstacle in her path: a hula hoop held up by the girl’s mom. The chicken pauses, seeming to ponder the predicament. Is that tasty treat a big enough draw to help the bird make the leap? YUP, it sure is! 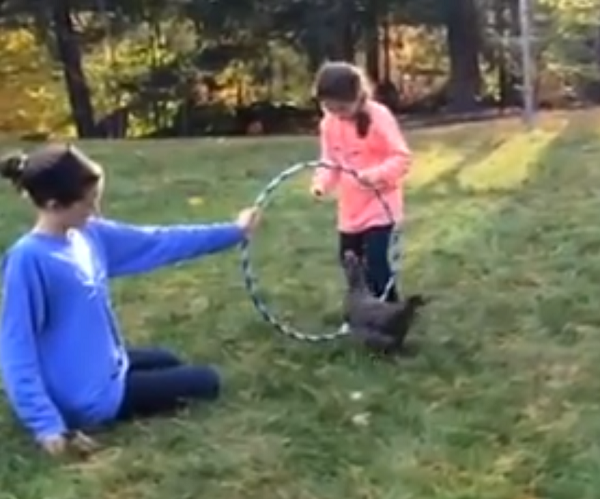 With the cutest hop ever, the chicken jumps through the hoop and lands neatly on the other side. Both the child and her mother absolutely roar with laughter, and we can definitely see why. That hop was just too much! Okay, who else wants to get a flock of backyard chickens now? *Raising hand* We had no idea that they could do tricks! Watch this brave chicken prove she’s no bird brain in the video below, and don’t forget to share with another backyard chicken farmer who’d love this clip.